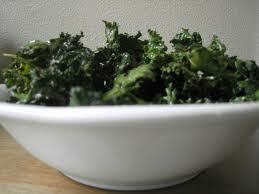 So delicious, great substitute for potato chips- Kale chips are loaded with vitamins, minerals and antioxidants. 2. With a knife or kitchen shears carefully remove the leaves from the thick stems and tear into bite size pieces. (careful not to make them too small because they shrink) Clean and wash thoroughly. Dry kale with a salad spinner. Mix kale, olive oil, lemon, apple cider vinegar and sprinkle with sea salt, nutritional yeast (lecithin) and optional-seasonings. (chili powder, dill etc.) It is easiest to use your hands to coat all the pieces well in a large bowl. 3. Bake for a few hours until crispy. Turn over for even baking. DO NOT BURN!